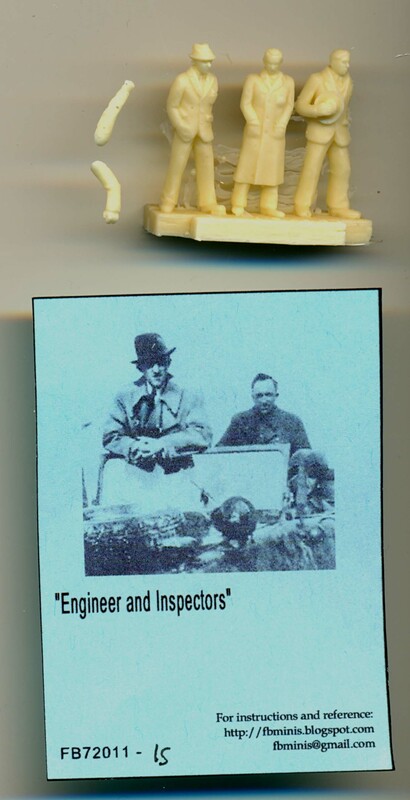 FBMinis 1/72 scale Engineer and inspectors. Casting quality is very good, with crisp detail and very natural poses. Average height is 24mm (1m73 in 1/72 scale). The set consists of three resin figures, two with a separate arm showing civilians in casual poses. These are one of the most realistic figures I have seen, with almost endless diorama opportunities, ranging from engineers inspecting a prototype (Dr. Porsche comes to mind), to civilian bystanders. They are in no way limited to any specific nationality. Nihil, except for the pictures of the figures found on the FBMinis weblog.